Book Review: David Baguley, Gerhard Andersson, Don McFerran, Laurence McKenna (2013) A Multidisciplinary Approach, 2nd Edition. Wiley-Blackwell, 2013. Figueiredo R, Azevedo A et al. Zumbido. Editora Revinter, Rio de Janeiro, 2012. Book Review: Tinnitus. Jos J. Eggermont, Fan-Gang Zeng, Arthur N. Popper, Richard R. Fay (Editors). Springer Handbook of Auditory Research, Vol. 44, 2012. Book Review: Jos Eggermont (2012) The Neuroscience of Tinnitus. Oxford University Press 2012. Research Topic at Frontiers in Systems Neuroscience: Ringing Ears: The Neuroscience of Tinnitus. Hosted by Jos J. Eggermont and Larry Roberts. 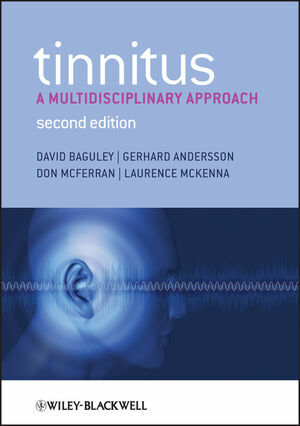 Textbook of Tinnitus, Editors: Aage R. Møller, Berthold Langguth, Dirk De Ridder and Tobias Kleinjung. Springer 2011. Based on the contributions of the First TRI Meeting: Tinnitus: Pathophysiology and Treatment. Editors: Berthold Langguth, Goran Hajak, Tobias Kleinjung, Anthony Cacace, Aage Moller, The University of Texas at Dallas, Callier Center for Communication Disorders, Dallas, TX, USA. Progress in Brain Research 169. Elsevier 2007.